As the battle against Chaos continues, many are slain. Chalana Arroy tries to heal as many of them as she can, which brings her into conflict with Humakt, grim guardian of the thing called Death. They argue many times. 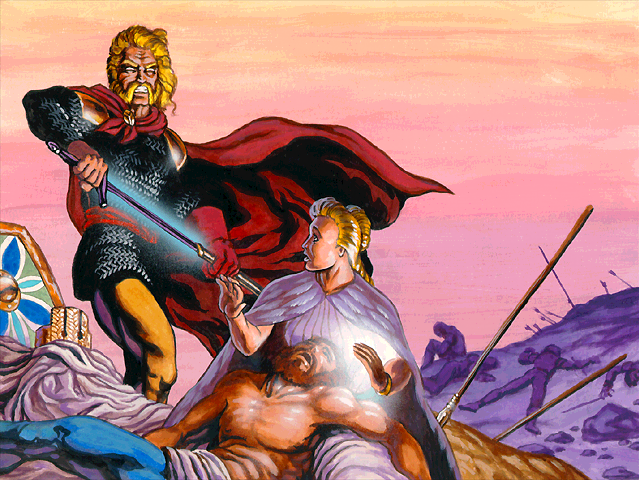 Then King Heort is seized and pierced in a hundred places by Thed, third member of the Unholy Trio. Chalana Arroy is about to put him back together, but Humakt stands in her way. "Although Heort was great, and Orlanth's people need him, anyone may be killed at any time. The line between life and death is one even you should not be allowed to cross. I forbid it." -Heal the scar of certitude under Humakt's tongue. -Heal the scar of hardness over Humakt's heart. -Heal the scar of sorrow under Humakt's eye. 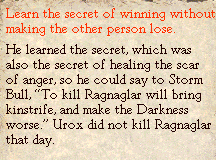 -Ignore Humakt and heal Heort anyway.